The 17th Annual Virginia Fly Fishing & Wine Festival will happen on April 8-9, 2017 at Meadow Event Park near Richmond, VA. The weekend will feature some of the most prominent anglers in the industry, including Lefty Kreh, Bob Clouser, Dave Whitlock, and Oliver White. The event will include vendor booths, demonstrations, classes, and wine tastings. Fly anglers from across the country will celebrate the 17th Annual Virginia Fly Fishing & Wine Festival on April 8-9, 2017. Held at Meadow Event Park just 15 miles north of Richmond on the site of the state fairgrounds, the Virginia Fly Fishing & Wine Festival is the first event of its kind to combine fly fishing and wine tastings. 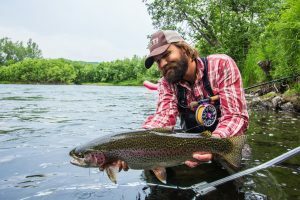 Fly fishing manufacturers, lodges, guides, tourism agencies, and specialty food companies are among the more than 100 vendors who hail from all over the country. This year’s festival sponsors include the Recreational Boating and Fishing Foundation, Temple Fork Outfitters, Green Top, NuCanoe, Orvis, Harman’s North Fork Cottages, Eastern Fly Fishing, Virginia Sportsman, Ruthless Outdoor Adventures, Blue Ridge Country, Bote, Mid Valley Press, Blue Ridge Outdoors, and Yellow Dog Fly Fishing Adventures. The highlight of the weekend is Saturday evening’s Festival After-Party, sponsored by Virginia microbrewery Steam Bell Beer Works. Tom Cooper, one of the owners of Steam Bell Beer Works, is a longtime fly angler who loves the festival concept. “Fly anglers are some of the most passionate folks you’ll ever meet,” says Cooper. “When you combine people who are passionate about the outdoors and introduce them to our product, it’s a real winning combination.” The Festival After-Party will feature heavy hors d’oeuvres like smoked salmon, shrimp, tenderloin, and salad. Tickets are $25 apiece and are expected to sell out well in advance of the festival. The 2017 festival will feature several of the industry’s most prominent anglers, including fly fishing icon Lefty Kreh. Other noted speakers and fly tyers include Ed Jaworowski, Bob Clouser, Wanda Taylor, Oliver White, Dave Whitlock, Brian O’Keefe, Mike Mercer, Blane Chocklett, Captain Gary DuBiel, and Colby Trow. Kayak experts like author Cory Routh of Ruthless Outdoor Adventures and Joe Mahler of NuCanoe will demonstrate how to access hard-to-reach waters. Christie Rother of East Coast Paddle Sports will demonstrate how to use a stand up paddle board to get in on the action. Between lectures, classes, casting demonstrations, and lunch from curated food trucks, sample fine wines from some of Virginia’s best wineries (tastings included with festival admission). Attendees can wash down their wine or brews with live music from Amber Waves. Returning this year are Family Fly Fishing Classes (3FC) sponsored by the Recreational Boating and Fishing Foundation. Parents and children will learn the basics of fly fishing and casting together. The entire family can also try fly tying! All 3FC classes and materials will be provided at no cost to festival attendees. Attention, Boy Scouts: You can earn your Fly Fishing Merit Badge at the festival through a program taught in cooperation with the Boy Scouts of America. This special class is free of charge to every uniformed Boy Scout. Space is limited, so reserve your spot today! For more information visit www.vaflyfishingfestival.org.